The Brothers Grimm (Brüder Grimm, in their own words, not Gebrüder - for there were five surviving brothers, among them Ludwig Emil Grimm, the painter) were Jacob and Wilhelm Grimm, Hessian professors who were best known for publishing collections of folk tales and fairy tales, and for their work in linguistics, relating to how the sounds in words shift over time ( Grimm's Law). Jakob Ludwig Carl Grimm and Wilhelm Karl Grimm were born in 1785 and 1786, respectively, in Hanau near Frankfurt in Hesse. They were educated at the Friedrichs- Gymnasium in Kassel and later both read law at the University of Marburg. The two brothers were in their early twenties when they began the linguistic and philological studies that would culminate in both Grimm's Law and their collected editions of fairy and folk tales. Though their collections of tales became immensely popular, they were essentially a byproduct of the linguistic research which was the Brothers' primary goal. In 1830, they formed a household in Göttingen where they were to become professors. In 1837, the Brothers Grimm joined five of their colleague professors at the University of Göttingen to protest against the abolition of the liberal constitution of the state of Hanover by King Ernest Augustus I of Hanover. This group came to be known in the German states as Die Göttinger Sieben (The Göttingen Seven). Invoking their right to resist on reasons of natural and constitutional justice, they protested against the King's hubris to abrogate the constitution. For this, all professors were fired from their university posts and some even deported. Though politically divided by borders of duchies and kingdoms at that time, public opinion and academia in German realms almost unanimously supported the Grimms and their colleagues against the monarch. Graves of the Brothers Grimm in the St Matthäus Kirchhof Cemetery in Schöneberg, Berlin. Wilhelm died in 1859; his elder brother Jacob died in 1863. They are buried in the St Matthäus Kirchhof Cemetery in Schöneberg, Berlin. The Grimms helped foment a nationwide democratic public opinion in Germany and are cherished as the progenitors of the German democratic movement, whose revolution of 1848/1849 was crushed brutally by the Kingdom of Prussia, where there was established a constitutional monarchy. The Brothers Grimm began collecting folk tales around 1807, in response to a wave of awakened interest in German folklore that followed the publication of Ludwig Achim von Arnim and Clemens Brentano's folksong collection Des Knaben Wunderhorn ("The Boy's Magic Horn"), 1805-8. By 1810 the Grimms produced a manuscript collection of several dozen tales, which they had recorded by inviting storytellers to their home and transcribing what they heard. These editions, equipped with scholarly notes, were intended as serious works of folklore. The Brothers also published the Kleine Ausgabe or "small edition," containing a selection of 50 stories expressly designed for children (as opposed to the more formal Grosse Ausgabe or "large edition"). Ten printings of the "small edition" were issued between 1825 and 1858. The Grimms were not the first to publish collections of folktales. The 1697 French collection by Charles Perrault is the most famous, though there were various others, including a German collection by Johann Karl August Musäus published in 1782-7. The earlier collections, however, made little pretense to strict fidelity to sources. The Brothers Grimm were the first workers in this genre to present their stories as faithful renditions of the kind of direct folkloric materials that underlay the sophistications of an adapter like Perrault. In so doing, the Grimms took a basic and essential step toward modern folklore studies, leading to the work of folklorists like Peter and Iona Opie and others. A century and a half after the Grimms began publishing, however, a sweeping, skeptical, and highly critical re-assessment disproved the Grimms' basic claims about their work. The Brothers did not in fact use exclusively German sources for their collection; and far from maintaining fidelity to those sources, they rewrote and revised and adapted their stories, just as Perrault and their other predecessors had done. The different printed versions of the tales display the latter fact; and the 1810 manuscripts, published in 1924, 1927, and 1974, accentuate the Brothers' consistent habit of changing and adapting their original materials. 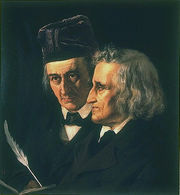 The irony is that the Brothers Grimm helped create a serious scholarly discipline that they themselves never practiced. In the very early 19th century, the time in which the Brothers Grimm lived, the Holy Roman Empire had just met its fate, and Germany as we know it today did not yet exist; it was basically an area of hundreds of principalities and small or mid-sized countries. The major unifying factor for the German people of the time was a common language. There was no significant German literary history. So part of what motivated the Brothers in their writings and in their lives was the desire to help create a German identity. Less well known to the general public outside Germany is the Brothers' work on a German dictionary, the Deutsches Wörterbuch. Indeed, the Deutsches Wörterbuch was the first major step in creating a standardized "modern" German language since Martin Luther's translation of the Bible to German; being very extensive (33 volumes, weighing 84 kg) it is still considered the standard reference for German etymology. The Brothers Grimm (1982). Fairy Tales. Julian Messner. ISBN 0-671-45648-2.